Superheroes weren't the only stars of Golden Age of comic books. There were also hard-boiled detectives, keeping America safe by solving crimes. 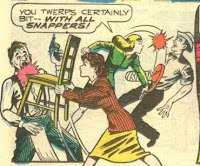 My brother just sent me an awesome example of the genre: Jill Trent Science Sleuth, a short-lived series from Nedor Comics. The plots are pretty simple: scientist-inventor Jill Trent and her friend Daisy solve a murder mystery (using one of Jill's inventions, natch') and kick the butts of the bad guys. They get into trouble, of course, but always figure out a clever way to escape, rather than waiting to be rescued. And they do it all without mussing their hair or breaking a nail. If you like stories with smart tough women, these comics are definitely for you. "Case of the Sanitary Murders"
"The Case of the Black Sheep Murder"